High-gloss luxury melamine dinnerware from Q Squared NYC is durable and virtually unbreakable. Versatile enough for use indoors or out, it serves as an elegant alternative to fine porcelain and ceramic. 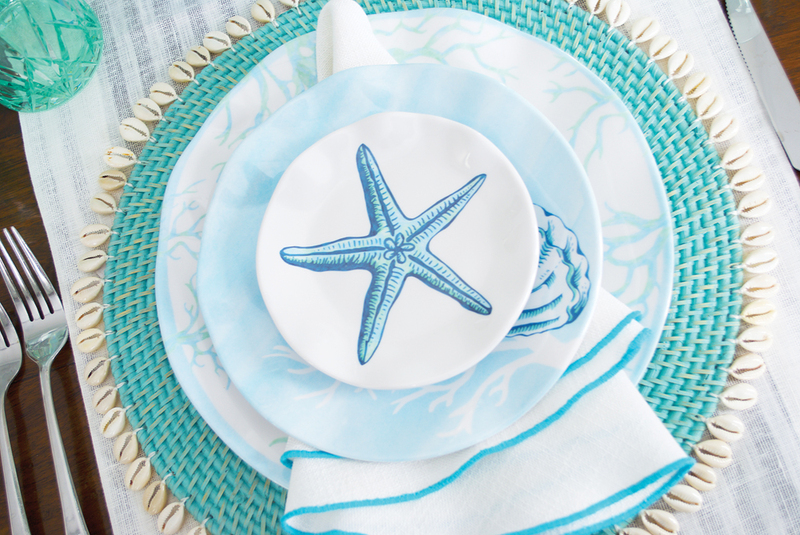 Captiva dinnerware mimics the peaceful blues of the ocean in intricately hand-drawn sea-life themes. Luxury table linens area win- and liquid-resistant. Enjoy your favorite drink in carefree style with crystal-cut drinkware crafted in BPA-free and dishwasher-safe unbreakable Tritan. 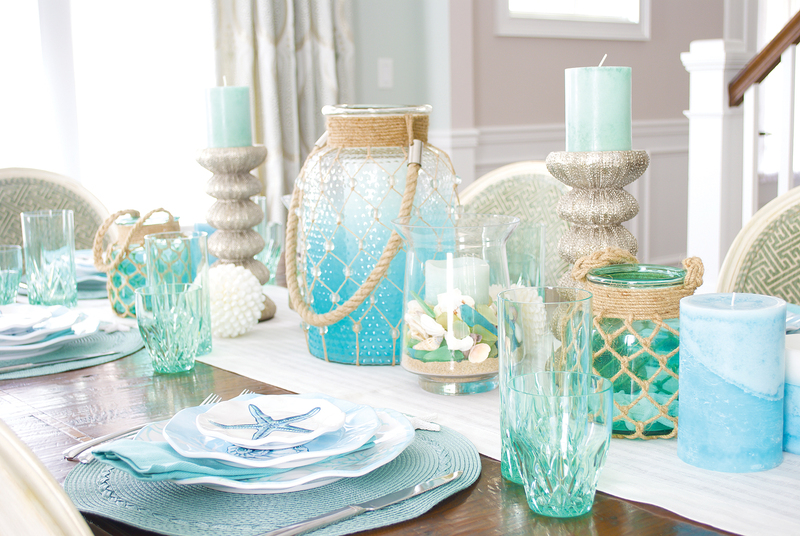 Set your table with the serene spirit of the sea. QSquared NYC founder and creative director Alaina Young wanted to transport the serenity of the beach indoors with this sea life-inspired dinner party at the home of her friend Morgan Parkes-Daylamani in Rumson, New Jersey. “I was inspired by colors of the ocean and sea glass, using light blues and greens and pale shades of aqua and white,” Young notes. She set the table with Captiva, a new collection made of high-end luxury melamine that “looks and feels like porcelain and ceramic, yet it’s virtually unbreakable—perfect for indoor and outdoor entertaining,” she says. Young hand-drew each intricate pattern in sea-life themes and calming hues. Each piece is made with natural dyes and hand-polished to a high-gloss finish. 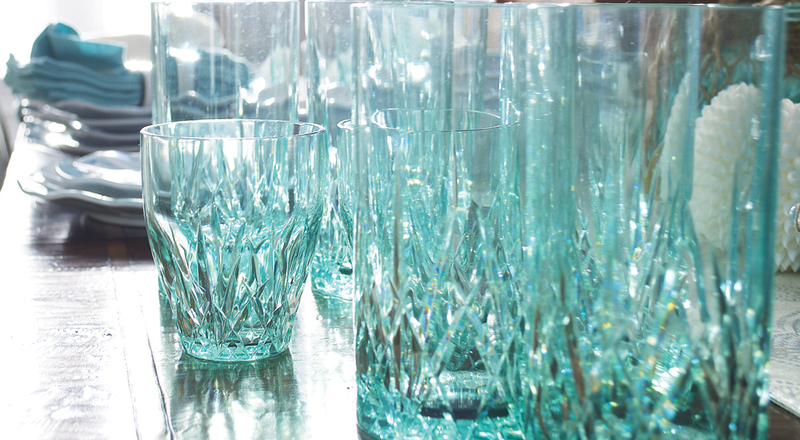 Complementary drinkware mimics natural cut crystal but is made of dishwasher-safe, unbreakable Tritan. “I wanted to inspire readers to create their own elegant yet practical and affordable summer dining and entertaining experience,” Young says. Design, Alaina Young of Q Squared NYC; dinnerware, (Captiva) and drinkware, (Aurora Crystal Cut in Seaglass) both from Q Squared NYC; silverware, Reed & Barton; placemats, napkins and runner, Mode Living; centerpieces, Home Goods; glass hurricanes, Pier 1; shells, sea glass and starfish décor, Michaels.